The world's rivers are in crisis, according to a new study by researchers from the University of Wisconsin-Madison Center for Limnology and the City College of New York (CCNY) that is published in the Sept. 30, 2010 issue of the scientific journal Nature. The study, led by UW-Madison limnologist and professor of zoology Peter McIntyre and CCNY modeler Charles Vörösmarty, combines, for the first time, indices of water security and biodiversity for all of the world's rivers, many of which are severely degraded due to issues of pollution, water diversion and introduced species. The world's rivers, the single largest renewable water resource for humans and a crucible of aquatic biodiversity, are in a crisis of ominous proportions, according to a new global analysis. The report, published on Sept. 30 in the journal Nature, is the first to simultaneously account for the effects of such things as pollution, dam building, agricultural runoff, the conversion of wetlands and the introduction of exotic species on the health of the world's rivers. 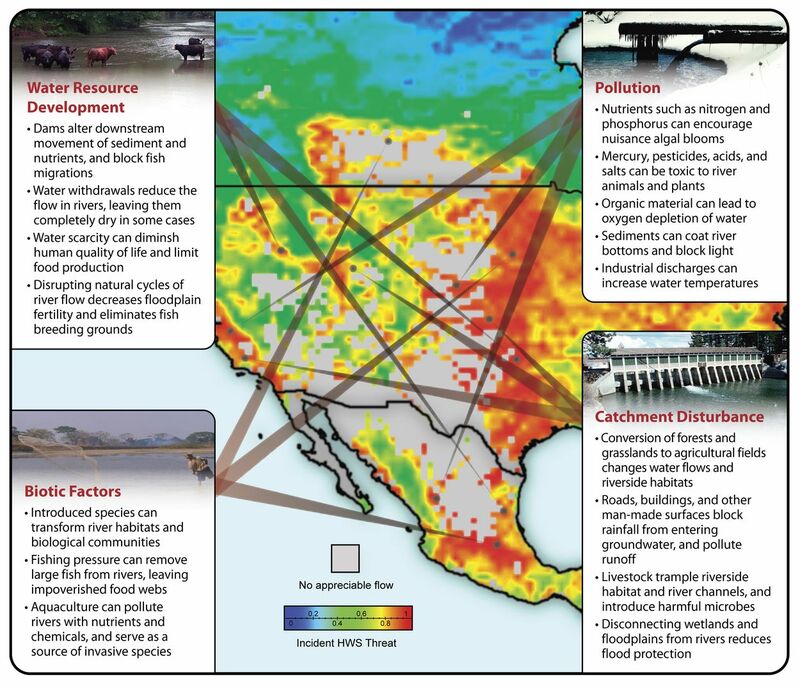 What jumps out, say McIntyre and Vörösmarty, is that rivers in different parts of the world are subject to similar types of stresses, such things as agricultural intensification, industrial development, river habitat modification and other factors. Compounding the problem is that some of the negative influences on rivers arrive in indirect ways. Mercury pollution, for example, is a byproduct of electricity generation at coal-fired power plants and pollutes surface water via the atmosphere. flowing through our waterways," explains Vörösmarty, noting that the study represents a state-of-the-art summary, yet was unable to account for such things as threats from mining, the growing number of pharmaceuticals found in surface water and the synergistic effects of all the stresses affecting rivers. "And what we're doing is treating the symptoms of a larger problem," Vörösmarty explains. "We know it is far more cost effective to protect these water systems in the first place. So the current emphasis on treating the symptoms rather than the underlying causes makes little sense from a water security standpoint or a biodiversity standpoint, or for that matter an economic standpoint." Among the startling conclusions of the study is that rivers in the developed world, including much of the United States and Western Europe, are under severe threat despite decades of attention to pollution control and investments in environmental protection. Huge investments in water technology and treatment reduce threats to humans, but mainly in developed nations, and leave biodiversity in both developed and developing countries under high levels of threat, according to the new report. "What made our jaws drop is that some of the highest threat levels in the world are in the United States and Europe," says McIntyre, who began work on the project as a Smith Fellow at the University of Michigan. "Americans tend to think water pollution problems are pretty well under control, but we still face enormous challenges." The hard lessons learned by the developed world, says McIntyre, can help governments and planners in other parts of the world avoid making the same mistakes and experiment with new strategies for promoting water security and protecting biodiversity. Instead of investing billions of dollars in expensive remediation technologies, strategies such as protecting watersheds, for example, can reduce the costs of drinking water treatment, preserve floodplains for flood protection and enhance rural livelihoods. Rivers of the world least at risk are those where human populations are smallest. Rivers in arctic regions and relatively inaccessible areas of the tropics appear to be in the best health. The analysis used data sets on river stressors around the world. Built into state-of-the-art computer models, the data yield maps that integrate all of the individual stressors into aggregate indices of threat. The same strategy and data, say Vörösmarty and McIntyre, can be used by governments worldwide to assess river health and improve approaches to protecting human and biodiversity interests. "We've created a systematic framework to look at the human water security and biodiversity domains on an equal footing," Vörösmarty says. "We can now begin presenting different options to decision makers to create environmental blueprints for the future."